Near the end of winter, I always get the urge to deep clean everything. The inside of the house just seems stagnant from my family being cooped up indoors all winter long. In addition, everything outside is muddy and coated with a layer of grime. In Michigan, and much of the Midwest, it doesn’t seem like winter weather is leaving any time soon. However, very soon it will be time to eye the exterior of your house and spruce things up for the year. 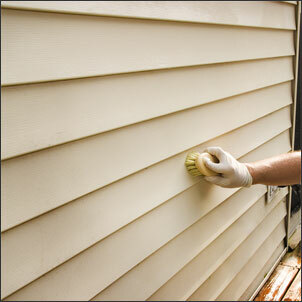 If your home has vinyl siding, although low-maintenance, it does need occasional cleaning. Pressure washing can work wonders. Some homeowners do own a pressure washer and use it twice a year. They are usually available to rent for a day for under $100. This could be the perfect solution if you’re only looking to get rid of a thin layer of grime. But what if your siding needs a little more love than that? What if you, like me, have some spots where birds and animals have left their impressions and you know they won’t come off with a little spray? Or, what if your white siding is starting to look a little green? That’s right, mold and mildew can easily show up on the outside of your house and ruin the look and feel of it if you don’t take care. The good news is you can take care of those things with a fairly simple arsenal of cleaning products you probably already have on hand. Sometimes you can find cleaning instructions printed on your siding warranty. If you don’t have that handy or don’t know what brand of siding you have, there is a good way to determine which cleaning product will work best. In general, you could use either a commercial cleaner designed for outdoor use, a bleach solution, a vinegar solution or a TSP solution. Wet & Forget Outdoor is an example of a commercial cleaner. It is a good, bleach-free mold, mildew, and algae remover. TSP is a highly effective cleaning agent that can be diluted and used with a sponge or brush. When combined with bleach, it removes mildew, mold, and algae. However, it also removes paint – so painted surfaces will have to be re-painted. In some municipalities, it is banned due to its effect on lakes and streams. It can cause algae overgrowth, which makes a hostile living environment for native wildlife and fish. This mix can kill plants as easily as bleach but is much safer for you and the environment. However, you can still breathe in fumes, so you need to be careful. Mix 7 parts water to 3 parts white vinegar. Make a gritty paste with baking soda and water and use it to scrub especially stained areas before applying the vinegar treatment. Most of these methods can be used with your garden hose and a spray nozzle a bucket, and/or a garden sprayer. A soft bristle brush will be helpful for textured surfaces. You will need rubber gloves and protective eye and face wear. Wear a long-sleeved shirt and pants to avoid getting cleaner on any exposed skin. In addition, use plastic tarps or drop cloths to protect plants. In each case, if you can wet and remove excess loose dirt and grime with a garden hose and spray nozzle. This will make your job go more quickly. With a Wet & Forget Outdoor cleaner, you will apply with a garden sprayer and leave it. Other methods, like bleach and TSP, will need to be applied and then hosed down after a short period of time. 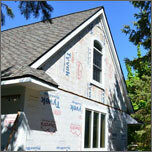 You will need to test anything you use on a small section of your siding before doing anything large scale. Using the baking soda and vinegar method, you will need a ladder and it could potentially be more time-consuming. Use a scrub brush to hit the spots that need the most work. You could potentially need to use a soft, long-handled scrub brush for the bleach method as well if you have significant mold or your white siding is looking green. Cover brick to ensure that it is not affected by runoff. Use only soft bristle brushes on textured surfaces to keep the grooves in the texture stain-free. Start at the bottom of the house for best results. Then, work up and rinse the cleaning solution completely before it dries. You don’t have to pressure wash your home’s vinyl siding to make it look new. 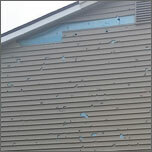 Make sure you test a patch to determine which of these deep cleaning methods is best for your siding and your skills. 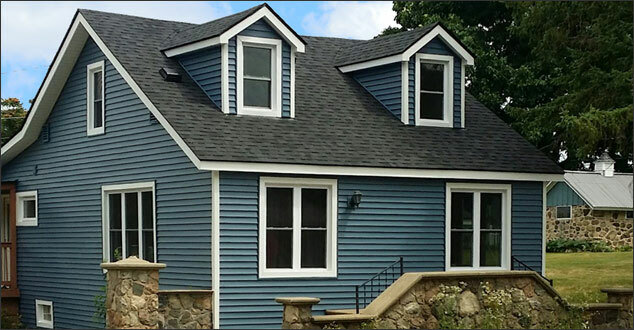 If you are building a home now, looking into renovations, or have just found out that you need new siding due to damage or age, you might be overwhelmed with the bounty of siding options.